I'm not sure how old I was when I first saw Scarecrows (1988), but I do know I was too young. It was one of those movies I knew I wasn't supposed to watch, but rented anyway one night while staying at my grandparents' house. It was a decision I regretted for months afterword. Scarecrows terrified me. I couldn't sleep (even in my parents' bed, where I sought refuge), I often laid awake at night staring at the ceiling, afraid to even look at the door for fear a scarecrow would come bursting through it any minute. For years I considered Scarecrows to be the scariest movie I had ever seen. To this day, there hasn't been a horror movie that has affected me quite like this one. Watching it as an adult, its power is somewhat dulled, but it is also easy to see how this film had such a profound impact on my young mind. There is something deeply primal about it. Maybe it's the ingenuity brought on by the shoestring budget. Maybe its the abject refusal to play by any traditional rules of filmmaking. Either way, Scarecrows is something special. Not a great film certainly. It's a movie made by teenagers who had never made a movie before. But that amateur quality lends it a unique kind of charm that sets it apart from other B slasher films of the 80s. The plot, such as it is, centers around a group of bank robbers who commandeer a small plane and kidnap the pilot and his daughter in order to make their escape. When one of their members goes rouge and parachutes from their plane with all their stolen money, they forced to make an emergency landing in a cornfield. They soon discover, however, that this is no ordinary cornfield, as the scarecrows that surround a nearby farmhouse come to life, possessed by the spirits of three dead farmers, and begin to pick them off one by one. First time director William Wesley conjures up an eerie, almost hallucinatory atmosphere (his use of night vision is especially creepy), as the scarecrows have the ability to mimic people's voices, meaning the audience doesn't always know who is talking and when. It's deliberately disorienting, for the characters and for the audience, and while this isn't always effective as it could be, Scarecrows is nevertheless a mean piece of work. 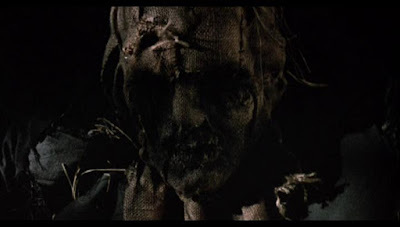 It's short, fast paced, and perhaps most disquieting of all, doesn't go out of its way to explain itself and the origins of its demonic scarecrows, which make them all the more terrifying. Their zombified victims often don't know they're dead, carrying on conversations with their new victims while trying to kill them as if nothing is wrong. The deaths scenes are still pretty graphic, even by today's standards. There's just something particularly disturbing about being gutted, stuffed, and turned into a living scarecrow. 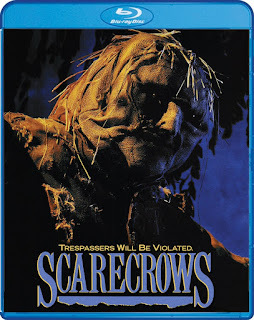 Killer scarecrow movies aren't exactly a very expansive genre, but Scarecrows is easily the strongest of the pack. Shout Factory's new Blu-Ray at long last brings the film back into wide release, which will hopefully shine a spotlight on this often overlooked horror gem. It doesn't always make sense, but that's one big reason why it works so well. In our prequel obsessed culture, modern horror films often spend too much time trying to explain the origins of their antagonists. Scarecrows flatly refuses to engage in such nonsense, driving headlong into an action/horror mashup that focuses on atmosphere over plot. And surprisingly it mostly works. Wesley doesn't belabor the plot details, and instead gives us a film that operates on a purely visceral level. Sure, parts of it feel dated and even goofy now, but it still hasn't lost its wicked edge over the last 30 years. The new Blu-Ray features audio commentaries and making-of docs that illuminate the rather unconventional process that lead to its creation. And while I'm not a huge fan of polishing up horror movies that benefit from their grainy haze, the darkness of the film remains intact and terrifying. Shout Factory has resurrected yet another cult classic, giving a whole new generation the opportunity to discover its multitude of B-grade riches. 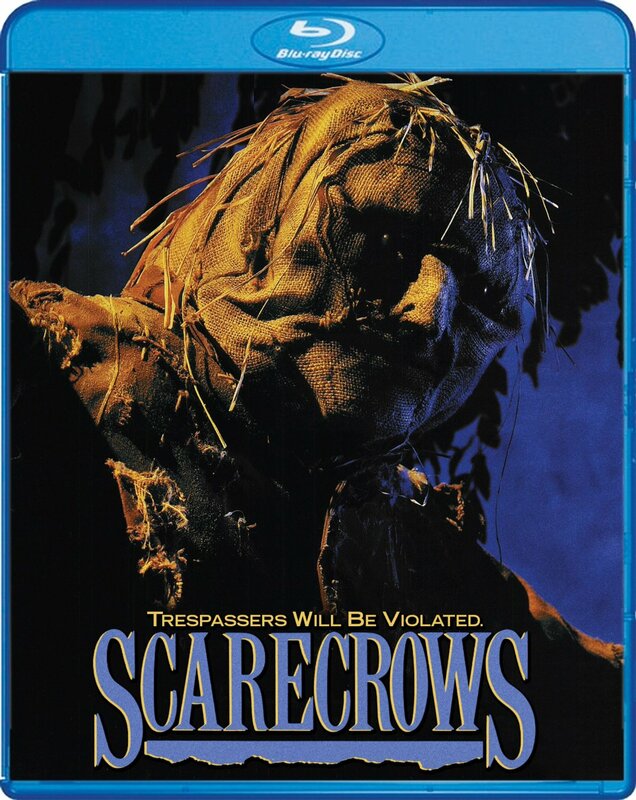 Scarecrows is available today on Blu-Ray from Shout! Factory. On "I Am Big Bird: The Caroll Spinney Story"